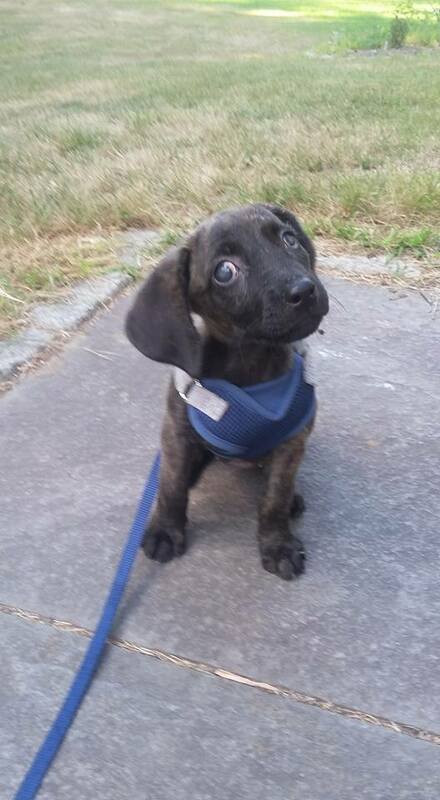 Little Ally is an almost 9 week old plott hound, she was the runt of her litter and is only 5 1/2 lbs. While plott hounds are typically 40-55 lbs the breeder thinks Ally will likely be 40 lbs at most, and I think she’ll likely be smaller than that. Though she is blind her hunting instincts are already showing up as she points when she catches a good smell and wants to follow her nose first and foremost. She is full on puppy, when she’s awake she wants to eat and play and then she likes nothing more than to curl up and take a nap near or on you. Ally is quickly making progress with doing her business outside but at such a young age that has a lot to do with training her human. She will settle in the crate though she’s too young to make it through the night without making a mess. Ally shows no signs of neurological troubles and has mastered going down my one step to my family room and surprised me by making it all the way up the stairs on her first try. Because she is such a little peanut she can squeeze through gates especially if it means finding her person or food. Ally, like all puppies, will benefit from a lot of socialization and training. She is already proving to be smart and showing improvement with walking on a leash. She is very food motivated which should help with training. Ally is only interested in playing, she has smelled our cat but hasn’t chased him and would love to play with another dog but our dog isn’t interested. She is great with our young son but would do best with older children who are more aware of where she is and just how small she is. While Ally is doing well on a leash a fenced in yard would be a bonus for this little girl since she loves to follow her nose, that being said I wouldn’t say it’s required. The vet says Ally is fully blind but completely healthy. The vet sees no signs of concern with her eyes and she’s already showing how being blind won’t slow her down at all. Everyone who met her quickly loved her but she’s ready to find her forever home. Ally is looking for her forever home. If you think it could be yours, read more about Adopting from BDRA before submitting your application below. BDRA relies on your donations to rescue blind dogs around the United States. Please consider giving in support of Ally.